The sky indeed fell on October 9th, 1992 — luckily only on a car. The Peekskill Meteorite, a “hammer”, is renowned for having traveled clean through the rear of a Chevy Malibu. Every time I think about the smashed car, I find myself anxiously looking up and apologizing for any ill-will I have done to the universe. It’s also best not to think of Peekskill shortly before bed. Although, if a meteorite and your paths ever do cross — you should consider the notoriety and monetary benefits… for your survivors. I only joke since chances are better that you will win the lottery! 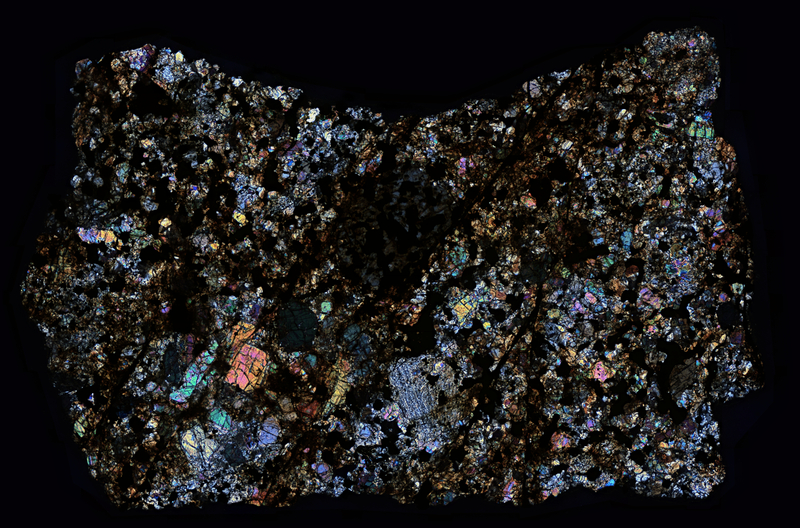 The meteorite in thin section shows some interesting colors and breccia features as shown in the panorama. Everything you want to know about the Peekskill Meteorite here.